Have you got the Eye of the Tiger? 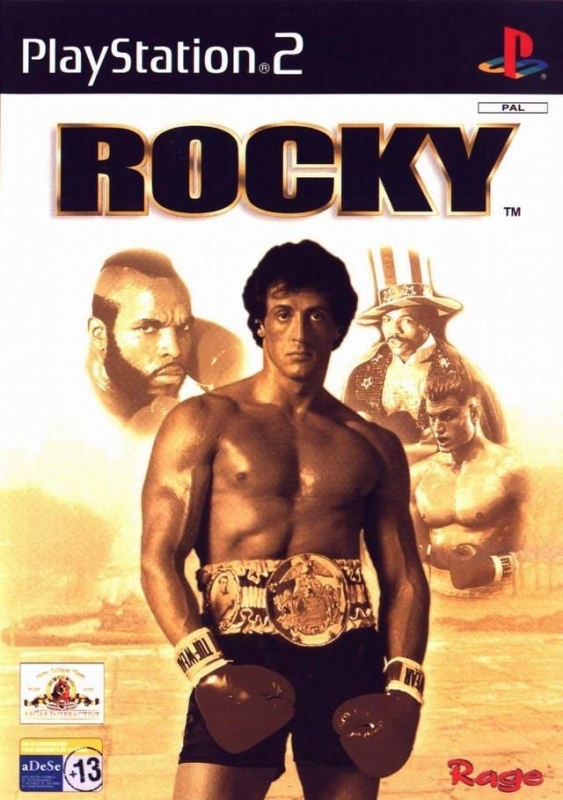 Based on the officially licensed Rocky movie anthology, you must take to the ring as the Italian Stallion or one of several other fighters including Apollo Creed, Clubber Lang, Ivan Drago or Tommy Gunn and fight your way through a variety of single and multi-player game modes. Fight your way through a variety of single and multi-player game modes using a huge range of punches from attacking hooks, jabs and uppercuts to defensive blocks, ducks and weaves. 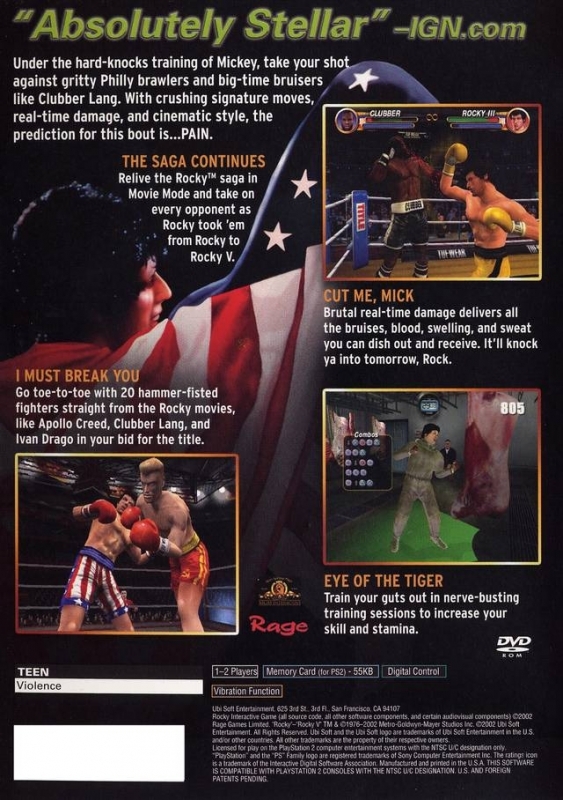 Rocky features a wide variety of fight and training locations painstakingly recreated from the movie anthology, from the early rundown gyms to the world’s best-known arenas, and is the ultimate boxing game franchise. 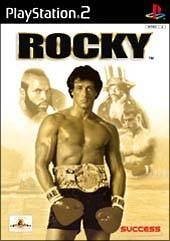 Movie Mode - Relive Rocky Balboa’s ascent to World Heavyweight Champion meeting Rocky’s opponents from the five films along the way. 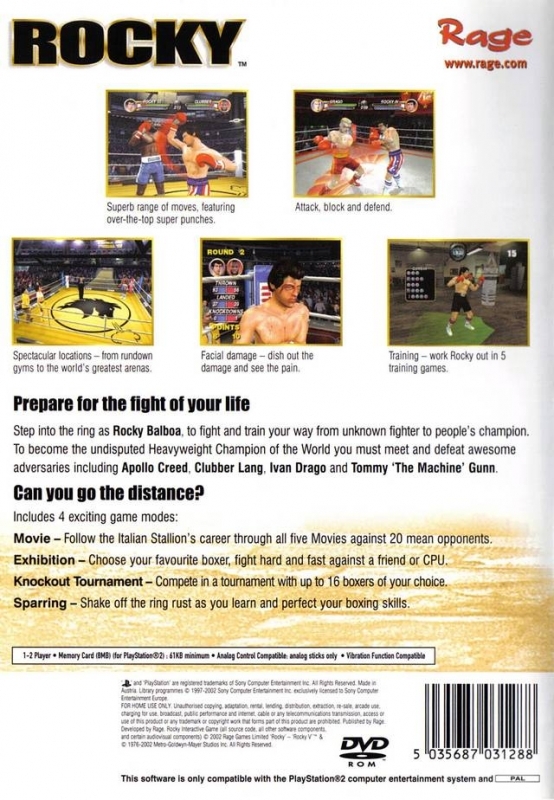 Exhibition Mode - Choose from any of the boxers you have unlocked in Movie mode and compete in single bouts against a friend or CPU opponent. 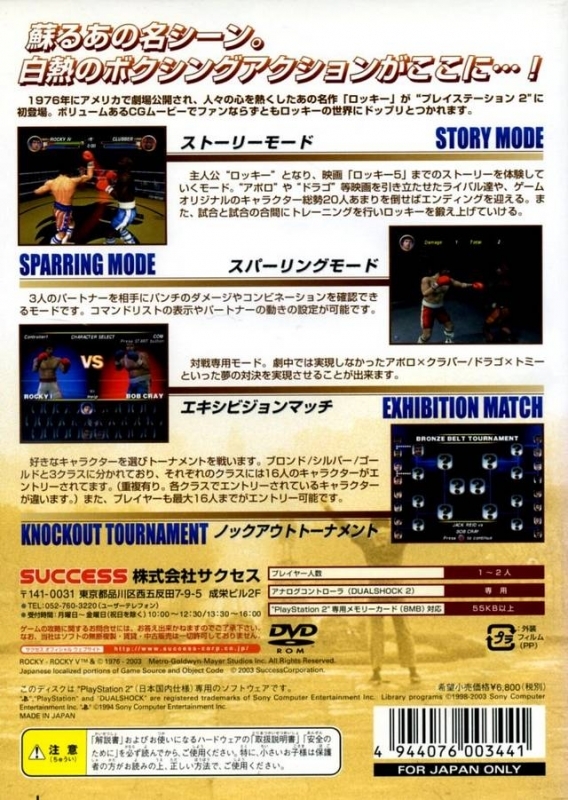 Knockout Tournament Mode - 16 boxers participate in a knockout tournament. Sparring Mode - Perfect your boxing skills against your three expert sparring partners. Training - work out on the Speedbag, Heavy bag, Situps, Skipping and Punch Mitts to improve different aspects of Rocky’s performance in the ring. Fight locations include Mighty Mick’s gym, Philadelphia Arena, Titan Beach Florida, Big Rock Nevada, Queensburys’ Fighting Club Washington and Moscow. Superb free-flowing animation featuring moves motion captured from a current World Champion boxer. Fast, smooth gameplay allows you to attack and block at a lightning pace. Huge range of punches available - Over 256 moves are faithfully captured including attacking hooks, jabs and uppercuts; defensive blocks, ducks and weaves; even a couple of dirty moves ready to be combined in different combos for each fighter. Realistic damage includes bruises, facial swellings, blood and sweat glistening on the boxers bodies as the action heats up. Facial animation allows you to see the expression of determination cross his face as your boxer steps into the ring, or the surprise registering as a punch lands and his jaw flies open. Lipsynch technology gives realistic mouth movements throughout the ingame speech, adjusting itself to the language you select to play the game in. Taunts allow the boxers to show off to the crowd, taunting each other with a variety of different moves. The boss characters also have bursts of speech from the original actors for Rocky, Clubber Lang and Tommy Morrison. Real-time recovery rates affect fighter's performance and tactics. The game tracks changes to your long and short term energy levels. 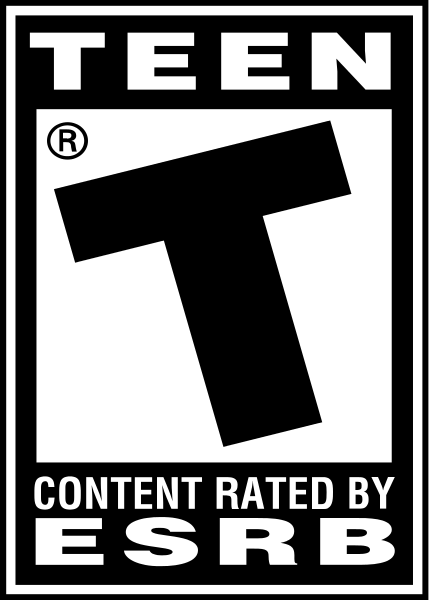 “ActiCrowd” Technology - animated audiences of up to 2000 per arena. I used to play this all the time.